The Pea Farm is short for “Penal” Farm, a place where prisoners were forced to farm. The Pea Farm is sometimes confused with the Caddo Detention Center and vice versa. 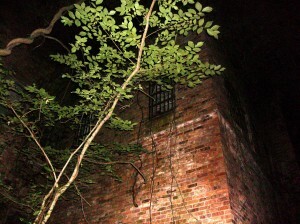 The Pea Farm, otherwise known as “The Old Jail” is overgrown and surrounded by fences. It is located on West 70th Street, approximately 2 miles outside of Watertown between the city of Greenwood and Bert Kouns. Locals recommend visiting the location in the winter months when the foliage isn’t as dense and it’s easier to see inside the fence. Locals claim that the pea farm was used as a prison, but it was shut down due to the excessive number of beatings and murders that occurred on site. There are a number of bodies said to be buried at this location. The prisoners who took up residence here were required to farm the land. According to some stories, prisoners who were unable to grow food on the parcel of land they’d been given, were not allowed to eat. Visitors have reported hearing disembodied voices and cries. It isn’t unusual for visitors to hear the sound of footsteps when no one else is in the building. Full bodied apparitions have been spied in various places at the Pea Farm.